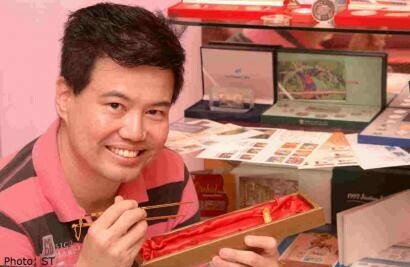 "When I was still schooling, I'd use my savings to buy stamps and what was dubbed postal 'first-day covers' - my oldest piece dates back to 1960, a year after Singapore was self-governed." His success philosophy has been to work hard and smart but to also maximise his returns by learning the leverage game. "My mentor and former boss Andre Lai taught me the importance of balancing leisure and work, and how maintaining positive relationships with your network is key to becoming successful," he says. I'm a spender when it comes to business needs, gadgets, software and technology; but a saver when it comes to my personal expenses. Q: On average, how much do you charge to your credit cards every month? I spend about $1,000 a month electronically on e-commerce and online purchases. But I don't have credit cards after a bad experience spending "future" money. I was one of the so-called "card revolvers" who took short-term credit loans via my credit cards. I ended up paying $14,000 for a commercial printer that cost $8,000. That was $6,000 in interest payments over the five-year loan tenure. My goal now is to ensure that my wife and I have sufficient funds for our golden years. As we do not have any children, our focus would be on wealth creation and retention for retirement, rather than leaving a legacy behind for future generations. Insurance, especially health-care policies, is essential for me. With the average lifespan increasing, I've to make sure my nest egg can last for the next 35 to 40 years and cover potential medical bills. My younger sister died in the early 2000s after a failed brain operation and my dad left us at 59 after suffering from a heart attack, so I'm aware of how daunting medical bills can become. My social media consultancy and coaching business has taken off and is on autopilot mode. I hope to set up a social media academy to benefit others and pay it forward via networking opportunities. My grandparents were the master tenants of the shophouse in Chinatown where I grew up. My parents were the frugal sort and ran a small business making and selling shoes. When I was seven, my entrepreneurial mind started ticking. I offered to be a "salesman" in my dad's shoe shop. That was how I earned extra pocket money because I was paid a "commission" for the shoes I sold. It started just over 20 years ago in 1993, when Singaporeans were given and allowed to buy shares in telecommunications giant SingTel. My former boss told me to buy as many SingTel shares as I could as it was guaranteed to make money. That marked my first foray into the stock market. A three-room flat that is less than 1,000 sq ft along Holland Drive. It is one of the few HDB blocks that have a pitched roof in Singapore. I got it in 2005 for $170,000. That was when my wife and I decided that we were not going to have any children and it would be wise to live in a smaller apartment. I spent $4,000 on 19 books from the Encyclopaedia Britannica series in my early 20s. The Internet wasn't prevalent then so there wasn't Google or Wikipedia you could turn to. I thought that owning these books would make me look knowledgeable and wise. Teaching and training have always been my passion, so I intend to grow my business and consultancy firm to benefit others. I've always believed that no one will retire as long as he remains energised. And my passion will keep me going. The walk-up flat near Holland Village where I live with my wife. And will take taxis when I commute for work. An executive apartment in Jurong East that my wife and I bought in 1997. This was just before the Asian financial crisis and the 1,600 sq ft unit cost us $525,000. In 2005, we sold the unit for $300,000, at nearly half of what we bought it for. It was around the time we decided that it was just going to be the two of us and a three-room unit would suffice. Unfortunately for us, the property cycle picked up after we sold the property. The first HDB flat I bought in 1991 for $102,000. I eventually sold the five-room unit in Chua Chu Kang for $423,000, and made a profit of around $300,000. Although I was single then, I could be the owner of the flat because it was the first public housing unit my family bought. My parents and siblings were listed as the occupants of the unit. At least half my salary in the early 1990s would go towards paying for the housing loan - so you could say I paid for it through my nose. But it was worth it because the profit came in handy to fund my wedding and my matrimonial home.